One of my goals for this fall is to create more purposeful learning opportunities for Little Brother. 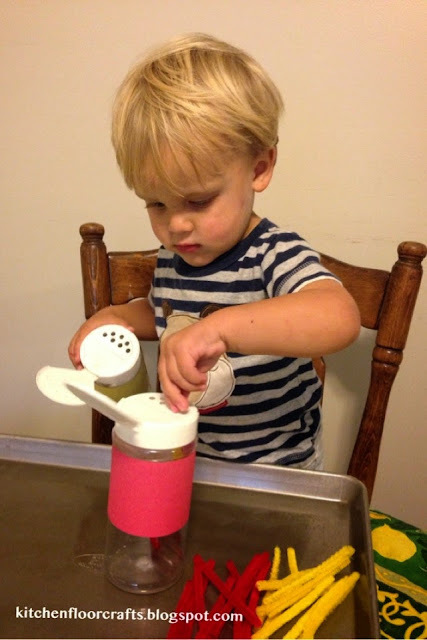 As he gets older we have more skills and concepts to explore. Although we've done activities which involve "dropping" or "pushing" objects into containers, this was the first time I've added a sorting element for Little Brother. Although I knew he was a little young, I wanted this to be an activity he could grow with, so I made it a two color sorting activity. I set the containers and pipe cleaners up at the table. Little Brother was instantly drawn in. I briefly showed him how to drop the pipe cleaners in and talked about the two different colors. He was excited to try the activity. 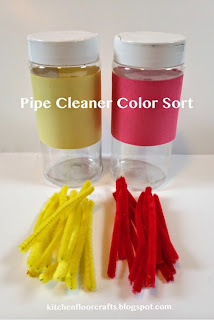 I let him explore for a little while and then modeled how to put the yellow pipe cleaners into the yellow container and the red pipe cleaners into the red container. I also continued to say the color words as we sorted them, to add a vocabulary element to the activity as well. 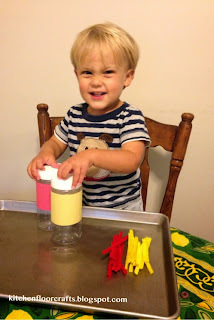 Although he didn't stick with the color sorting very long, he did watch what I showed him and put the ones I handed him into the right color containers. He then became more interested in trying to get the pipe cleaners back out of the containers. I'm looking forward to trying this again and seeing if he is able to think a little more about sorting the two colors.